This is the second article in our series providing an overview of basic RAM Mounts. Our last post profiled the variety of handlebar mounts. Today we are going to cover RAM suction cup mounts. Suction cup mounts are the most popular for use in autos. There are a few states that have laws forbidding placement of anything on the windshield of your car including California and Minnesota. In those states, consider using a dash plate with many of these suction cup mounts. All RAM components have a lifetime warranty. This is a huge bonus with a suction cup mount. Many of RAM’s suction mechanisms are patented and really do stand up to the test of time. RAM suction cup mounts are available for recreational or industrial use. All can be coupled with a RAM arm, cradle adapter and custom cradle. One of the most common RAM suction mounts is pictured within this article. It is the RAM-B-166U metal arm suction cup mount. The suction cup mechanism is made of plastic and features a 3.3 inch diameter base and this is good for mounting light to moderate weight items. The base has a twist lock vacuum mechanism which helps you to get a good secure hold. The typical use of this one inch ball mount is for holding phones, GPS units and tablets. If you keep the weight to less than a few pounds, you should be quite happy with this mount. This mount can be paired with many of RAM’s custom and universal cradles. If you pair it with one of their X-Grip universal cradles, you will not need the mounting diamond on the end, but save it in case you ever want to use this mount for a different device. RAM suction cup mounts are available in a variety of forms. The RAP-B-166-2U can be used for lighter devices such as a phone or GPS. 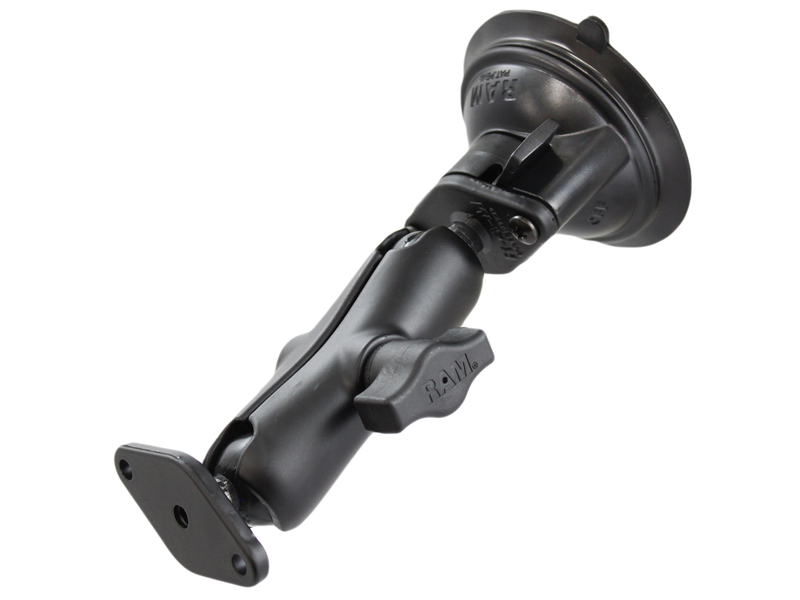 This mount is constructed of plastic with a 2.75 inch suction cup that also uses a twist lock. It comes with the standard diamond shaped adapter to attach to most custom cradles. Not recommend using these for heavier devices but it’s fine for lighter stuff like a smartphone or GPS. RAM also makes some very heavy duty suction cup mounts that deploy multiple suction cups. They are the same suction cups that are used in the RAM-B-166U that is pictured in this article. Add a RAM-B-101U mounting arm with round base and a custom cradle. These are available with coupled tablet mounts and you can use these for heavier devices such as a full size Apple iPad. You can also look at the RAP-333U base which can work similarly to accept two suction cup bases and can be coupled with the RAM-B-101U mounting kit. All of the RAM suction cup mounts discussed come with a lifetime warranty and can be used with a variety of custom and universal cradles. They all work well in low to moderate vibration environments. We do not recommend suction cups for use on motorcycles as the vibrations can compromise the suction grip over time.